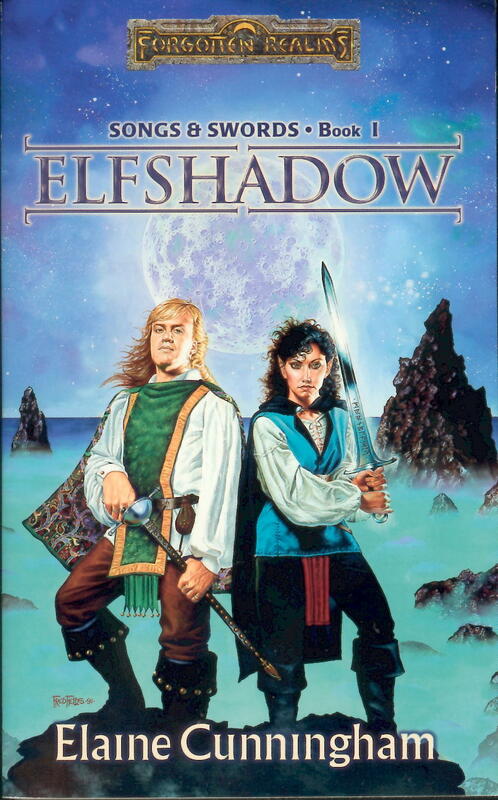 Elfshadow – Let's Read TSR! Elfshadow was the first novel by Elaine Cunningham, a newcomer to the Forgotten Realms’ stable of authors, but we’ll be seeing plenty more of her in the future. I’ve been looking forward to this one for a long time, slogging through the likes of Feathered Dragon in the expectation that I’d soon get to a book with well-rounded characters, good writing, and a halfway decent plot. At least, I remember this one being good… but that was a long time ago. Do my memories match up to reality? Let’s find out. But first, let’s talk about cities. Waterdeep, the City of Splendors, is one of the largest cities in Northern Faerûn. As the site of one of Ed Greenwood’s early Forgotten Realms D&D campaigns, it’s documented in ludicrous detail by the tabletop D&D material. But unlike the village of Shadowdale (the epicentre of another of Greenwood’s campaigns), which has been visited in six novels so far, Waterdeep has only appeared twice in Realms fiction, and that only briefly. The novel Waterdeep spends 95% of its time on the road to Waterdeep, in the sewers under Waterdeep, on a mountain near Waterdeep, et cetera, but almost no time in the city itself. And a couple of characters pass through it briefly in The Halfling’s Gem, but they don’t see much of the city outside of a seedy dockside bar. Why is this? There’s no lack of material to work with in Waterdeep, after all — Waterdeep and the North was the very first Forgotten Realms D&D supplement to be published after the Grey Box. I think it has more to do with the challenge that cities pose for a fantasy writer. Rural settings — villages, roadside inns, long stretches of empty road — are all very easy for a modern writer to envision and write about. It’s not that different from a modern rural setting, right? Swap horses for cars, horse-driven carts for trucks, ploughs for tractors, and not much has changed. But the cities in a medieval fantasy world are much harder to envision. What are the inhabitants’ daily lives like? What sorts of strange and wonderful things will you see when you walk down the street? How do these huge crowds of people get along in such a small space? Suddenly you have to start thinking about details like economics, sanitation, and politics because they’re woven into the fabric of how a city works. No wonder most authors shy away from that. Elfshadow is the first Realms novel to spend significant time in a city where the city actually feels like a living, breathing place. We meet people from a variety of social classes, see how seasons and festivals affect the tempo of city life, visit inns, private residences, public squares, streets, alleys, et cetera. I wish more of these books would take that risk, because urban settings provide such tremendous potential for stories that goes largely unexplored by Tolkien-style exploration-based fantasy. I’ll avoid spoilers here as much as possible, since I try to avoid spoiling the books that are actually fun to read. The plot centres around a small part of a larger conflict that hasn’t been explored yet: the interracial conflict between the various castes of elves, where a conspiracy of gold elves is trying to unseat the moon elves from the kingship of Evermeet. It’s good to see elven society finally getting some attention; despite their thousands of years of culture and history, most authors don’t go any further into characterizing elves than the usual “nature-loving hippies” stereotype. Elfshadow‘s plot gives the impression that the elves have an ancient culture and equally ancient conflicts, even though we don’t see much of it from the perspective of the non-elven protagonists. The short version: A half-elf Harper agent with a shadowy past finds that she and her associates are being stalked by a deadly assassin. She spends the book trying to hunt down the killer while protecting her goofy, foppish travelling companion; meanwhile, she has no idea (but the reader does) that her sidekick is actually another agent of the Harpers planted to spy on her. In the end, it leads back through layers of deception to a big conspiracy. It’s delightfully twisty and doles out the revelations a little bit at a time, leading to a satisfying conclusion. I always appreciate any plot in a fantasy novel that departs from the “go on quest, fight monsters” archetype, so all the mystery and subterfuge and hunting for answers gets high marks from me. And the theme of internecine betrayal between Harpers is a good one, adding a much-needed layer of complexity to the simple “Harpers good, Zhentarim evil” stance that The Parched Sea ran with. Reading this gave me a chance to ponder possible approaches to plotting a story. Some of the books we’ve looked at so far — including all of the really terrible ones — take a very scene-based approach to plotting. The author thinks of a few cool scenes they’d like to write, possibly ones that would look awesome when illustrated on the cover of the book or airbrushed on the side of a van, and then come up with a plot that somehow moves the characters from scene to scene. The actual mechanics of getting the characters to where the plot needs them to go might be a ridiculous coincidence, an unexplained intuition, prophetic guidance, or even just straight-up divine intervention — whatever takes the least effort. These books never quite feel satisfying because as cool as the individual scenes might be, they don’t feel like real stories without the connective tissue that convincingly ties them together. A better alternative, as seen in several of the best books we’ve looked at so far, is a more character-driven approach. You set up a bare outline of a plot, give your heroes and villains some good motivations, then in each scene you ask “What would this character do here to further their goals?” The result is an enjoyable story where well-rounded characters move the plot along themselves, rather the reader having to watch the author push a bunch of paper dolls around. Elfshadow falls into this category; the characters have well-defined motivations and distinct personalities, and their reactions in each scene and decisions about what to do next feel driven by who they are. However, while it may be laid down along promising lines, the mystery plot is pretty thin in some places. A couple of the events that keep the plot moving, like when Arilyn discovers Perendra’s snuffbox near the beginning or when she runs into seemingly everyone she’s ever met within a block of the Drunken Dragon tavern, are improbable coincidences rather than the logical outcomes of a chain of events, and stand out like sore thumbs alongside other better-integrated plot points. And the eventual villain is much too obvious from the outset, so the final revelations don’t really come as a surprise — the satisfaction is largely just from seeing why they did it rather than whodunit. I’m not surprised to see these sort of things in a first novel, but they definitely mar the potential of an otherwise promising debut. Secret identities are a pervasive theme here. Arilyn has an identity that’s been kept secret from her, and doesn’t find out about it until the end of the book. She’s a master of disguise, too, who spends much of the novel hiding her own identity behind a series of illusory personas. Danilo keeps his keen intellect hidden from everyone, even his own family, by pretending to be a useless twit. And the identity of the story’s main antagonist is kept secret right up until the end — well, from the characters, at least. The other consistent theme among the major characters is a sense of not belonging. As a half-elf, Arilyn doesn’t feel welcome in either human or elven society. Danilo no longer feels comfortable in his “foolish dandy” role and wishes he could shed it. Elaith was effectively exiled from elven society and had to carve himself out a new place among humans. Bran Skorlsun lost his family and spent years wandering the wilderness. Everyone feels unfulfilled, which gives them solid motivations and leads to a lot of good interactions. The characters here are some of the strongest in the Realms novels to date. Both the major and minor characters are deftly rendered with interesting personalities, sensible goals, and plenty of small details that round them out. It makes Cunningham’s Waterdeep feel like a lived-in place inhabited by real people. Compared to a book like Pool of Radiance, whose city of New Phlan was an empty and dull place populated by cardboard citizens, it feels pleasingly vivid. Arilyn Moonblade is, after Alias from Azure Bonds, one of the few excellent female protagonists in the Forgotten Realms novels. Like Alias, she’s jam-packed with both positive and negative traits: smart, badass, forthright, and independent, yet also stubborn, irritable, defensive, and emotionally withdrawn. We first see her at age fifteen in a prologue that establishes her character traits and explains how she ended up the way she did, which makes her abrupt transformation from an excitable, impulsive teenager to a sullen, withdrawn adult all the sadder. I appreciate that Cunningham didn’t jump directly into the story; without the setup for Arilyn’s character, watching her slowly defrost over the course of the novel and learn to open up to Danilo wouldn’t be nearly as satisfying. My only complaint would be that her whole “honourable assassin” schtick, where some people need killing but she’ll only kill them in a fair fight, is a rather silly way to keep her from veering into anti-hero territory. Danilo, the deuteragonist who’s keeping tabs on Arilyn in the guise of an upper-class idiot, is a very enjoyable foil for her. He’s got many traits which Arilyn lacks: social adroitness, emotional awareness, an open mind, and a broad assortment of family, friends, and acquaintances. But they both share a sardonic wit, cunning, and a talent for deception, which is a good recipe for entertaining banter. We get to watch their relationship evolve over the course of the novel from aggravation to guarded mutual respect to full-blown friendship, and it’s not an easy process for either of them. By the time they finally come to accept each other for who they are, it feels like they’ve earned their happy ending. The underworld boss Elaith “the Serpent” Craulnober is a minor canon character from the 1988 D&D tabletop supplement Waterdeep and the North, one of many non-player characters invented by Ed Greenwood to populate his imaginary city. But Cunningham takes his short description from the tabletop material and turns him into a tragic figure, an exiled elf who lost everything and turned to crime and cruelty to make a new life for himself. He’s still an evil jerk, mind you, but he’s a jerk with a good backstory and motivation who plays a pivotal role in the plot. He’ll be back in Cunningham’s later novels as a persistent anti-villain, often paired with Danilo, because putting the two of them together is a hilarious disaster. It really says something about the elves in this story that Elaith is the least racist elf here, because he’s still kind of a prick. To the elves, humans are short-lived, expendable yokels; “one human more or less is of no consequence to me,” as one gold elf puts it. The gold elves, still bitter about the fall of Myth Drannor and the moon elves’ control of Evermeet, insult and sneer at the moon elves at every opportunity. And almost all elves are horrified by half-elves like Arilyn, whom they see as mongrels. It’s a much more nuanced take on elves than the usual “good-hearted guardians of nature” stereotype we’ve inherited from Tolkien, and it makes them feel much less cliché and more realistic. Most of the elves we see here come from ancient aristocratic families, which probably accounts for their snobbishness compared to the elves from previous Realms novels. Khelben “Blackstaff” Arunsun, an archmage who’s a pivotal character in Realms lore, finally gets an appearance with some decent characterization. In Waterdeep he was basically a younger, more jerkish version of Elmister whose primary role was to be rude to the heroes. His brief cameos in Spellfire and The Halfling’s Gem were too short to be worth mentioning. Here we get to see some more facets of his character: a keen intellect, a dry, mordant sense of humour, and a deep sense of responsibility. His serious manner and “ends justify the means” philosophy contrast well with Danilo’s flippant nature and strong sense of justice. There are some wonky bits, certainly. The occasional continuity error, like someone sheathing their sword twice in a row. The occasional intrusion of the game mechanics into the writing, like the whole “elves finding secret doors” thing that even Gygax couldn’t be bothered to justify. The inconsistency about how “real” the illusory clothing for Arilyn’s magical disguises are — she’s described as ripping them and hiking them up, so clearly they’re not entirely illusions. Things like that. But they’re small things, and overall the quality is still quite high. The dialogue is crisp and often very funny, the settings are well-described, and there are lots of juicy little details that give the world and the characters some richness and depth. The pacing is quite good, too. The exposition is very gradual, and usually feels like something the characters have to earn rather than something which gets dropped on them for free. Given the book’s preference for mystery and suspense over action, it’s no surprise that there are far fewer fight scenes here than in your average Realms novel. What battle scenes it has are nicely done and give the characters a much-needed sense of vulnerability. Even though the characters are extremely competent fighters, you don’t get the feeling that they’re invincible like the characters in R.A. Salvatore’s novels, especially against large groups of foes. It’s great fun to read, and the character work is really quite good by the standards of the books we’ve seen thus far. As such, I’m willing to forgive a few of its venial sins. Although it was originally a standalone book in the Harpers series, the characters were popular enough to spawn a series of their own, of which this retroactively became the first. I’m quite looking forward to reviewing the rest of those, but not all of Cunningham’s novels were up to the same standard of quality. We’ll see how that plays out once we work our way up to the mid-1990s.